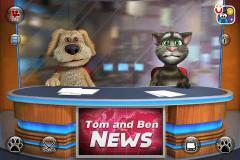 Talking Tom & Ben News for iPhone - Talking Tom & Ben have become famous TV news anchors! Talk to them and they will repeat what you say in turns. Create & record funny conversations between them. You can also customize the app by uploading your personal videos! Just press the TV button in the application to record a video with the camera or choose one of your existing videos from your Photos gallery. 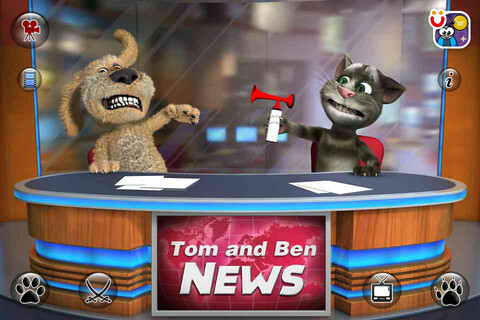 Once your personal video is in the app, make Tom & Ben comment on the video. And of course you can record the conversation and send the video to all of your friends to see. · Talk to Tom & Ben and they will repeat in turns. · Poke Tom & Ben to make them fall of their chairs. · Swipe Tom & Ben to make them swivel around in their chairs. 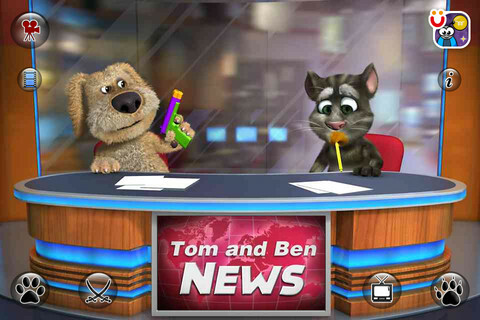 · Press the dog paw button and Ben will annoy Tom with a boxing glove gun or a toy dart gun. · Press the cat paw button and Tom will annoy Ben with a water pistol, air horn or a toy blow gun. You have to upgrade the app to get these animations. · Press the crossed swords button to make Tom & Ben wrestle. 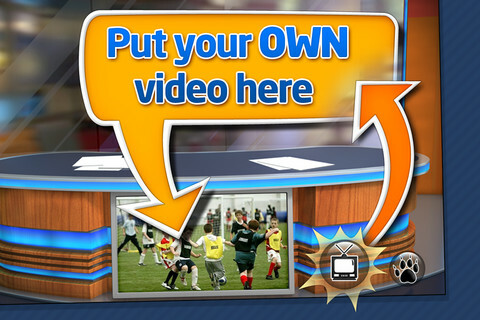 · Press the TV button to customize the videos that are being played on the TV. Record the videos yourself with the camera or choose one of your existing videos in your Photos gallery. · Record videos and share them on YouTube, Facebook or send them by email or MMS. · If you want no ads in the app & all of the cat paw button animations, you have to make an in-app purchase. · The TV button is not available on lower spec devices: iPhone 3G and lower, iPod 1st and 2nd generation. · iPod Touch 1st, 2nd & 3rd generation owners: Your earphones must have a microphone otherwise Tom & Ben won't be able to hear you!